Extreme Abrasives - Portfolio | A Full Service Marketing Agency based in Toronto, Canada - Karmatize Inc.
"Karmatize gave us a strong web presence that we could approach new suppliers with. They went above and beyond what was expected and I highly recommend their services to anyone who is passionate about their business." 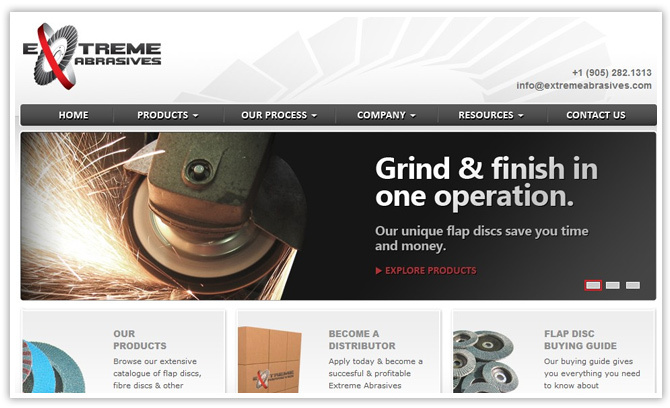 Extreme Abrasives' previous website was lacking in all aspects of design, architecture and strategy. Everything from the design to the content was disorganized and difficult to understand. This made it very difficult for their prospective customers to determine who they were and what they offered. Furthermore, they were scheduled to attend a major manufacturing show in just four weeks so needed to get their marketing material in order as quickly as possible. Even though the content was disorganized, this provided us a lot of material to work with. They made several products and had lots of resources that they provided the customer. Therefore, the first step was to develop a strong information architecture. We took all their content that included images, text and videos and reorganized it into coherent sections that new visitors could identify quickly. We then developed the site in a manner that highlighted key products as well as important resources. Afterwards, we connected the website's look and feel to develop Extreme Abrasives' custom tower banners that helped them stand out at the show.